John Hafner was a happy kid. Born May 12, 1961, to Carl and Joan Hafner in Parkston, he loved music from an early age. As a 1979 graduate of Parkston, he liked listening to bands at Island Park Ballroom in nearby Milltown. His favorite group was Festival – so much so that he asked band members Ray Roth and Dan Hohn if he could be part of the group. Soon John became Festival’s bus driver, but he secretly desired to be on stage. 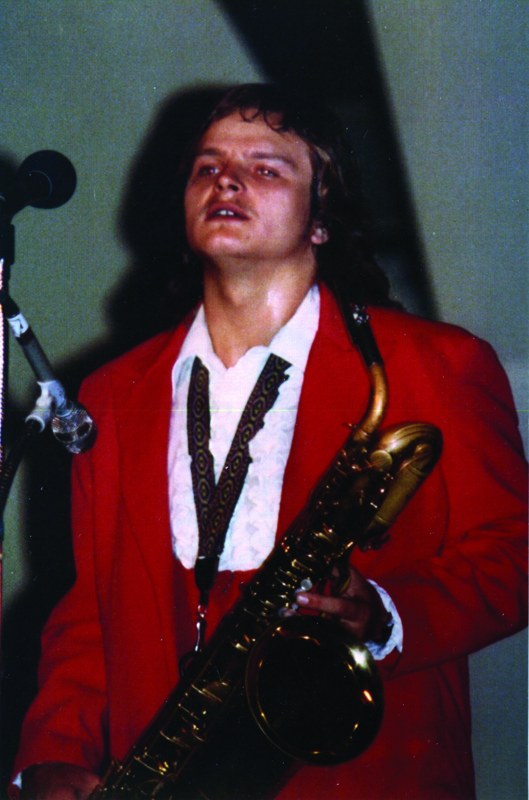 While the band was recording its third album in January 1981, John began learning the baritone saxophone from Curt Pottratz. It wasn’t long before he realized his dream! From then until 1993, John drove the bus and played with Festival. His lead vocals were featured on Billy Idol’s version of “Money Money,” Bruce Springsteen’s “Born in the USA,” and a couple of John Mellencamp tunes. John was a hard worker, had a black belt in taekwondo, and became the band’s bouncer. Hafner was also the heartthrob of the band, as many female fans considered him their first crush. One of those fans became his wife. Shelly had lived across the Missouri countryside from the Festival farm. She and John had four children: Hannah, Broden, Sarah, and Dalton. John’s chronically painful back caused him to leave the band in 1993. He entered chiropractic school in August 1997and started a chiropractic clinic in Wolf Point, Montana, in March 1998. John Hafner was tragically killed while riding his bicycle in August 2000. The South Dakota Music Association is proud to honor John Hafner with its Spirit of the Music award.